Spain is a vibrant country full of life and rich in culture. Ensuring your travelers can take advantage of its many charms often means making compromises between what’s easy and what will give them the best experience. The advent of Spain’s high-speed AVE rail service has helped simplify the logistics of travel; Valesa Cultural’s customized tours and itineraries make it just as easy for you to build out a fully comprehensive experience. 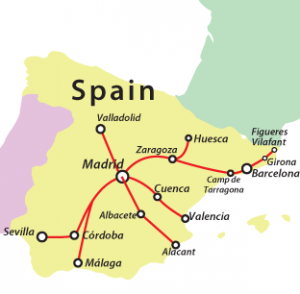 With routes to many of Spain’s top destinations, the AVE rail system offers both variety and convenience. Instead of constant transfers, booking mishaps, missed connections or worse, you can help your travelers experience those destinations during hassle-free day trips. Travelers staying in Madrid, for example, can reach several destinations in less than 2 hours via the AVE. Your travelers can spend a day soaking in the history, atmosphere, and culture, but return to the same hotel in time for a nice evening meal or night out on the town in Madrid. Suggested day trips include a visit to the spiritual mecca of Toledo, or to the coastal town of Valencia, the birthplace of paella and the home of the legendary El Cid. A visit to Segovia delights with the monumental drama of its Roman aqueduct and fairy-tale beauty of the Alcazar castle, while the echoes of a rich Moorish heritage emanate from the streets and buildings of Cordoba. All of these are UNESCO World Heritage sites, and reflect both history and regional differences around the country. Maybe your travelers would prefer to do the reverse commute: from these locations, a day shopping or taking in the sites in bustling Madrid is just a short ride away by train. Combine this with Valesa Cultural’s customized tours and itineraries and you can tailor the experience specifically to meet the interests or needs of a wide variety of travelers. Why Use Valesa Cultural for your arrangements? Navigating the AVE system takes more than just reading the maps and schedules. Valesa Cultural’s team of consultants takes care of many of the details that make every journey hassle-free, from developing perfectly timed travel schedules to ensuring all passengers have seat reservations. Our advance teams have identified the best hotels and restaurants in each destination so you don’t have to, and our continuous local inspection guarantees their levels of quality. We also have relationships with the most knowledgeable tour guides and local specialists, and we create one-of-a-kind experiences to perfectly match your travelers’ interests. Click here to see one of our sample Spain rail itineraries. These are just a few examples of the ways in which Valesa Cultural can build on and enhance all the advantages rail travel has to offer. Contact Valesa Cultural Services for help planning a Spain by Train itinerary for your travelers’ next trip to Spain.